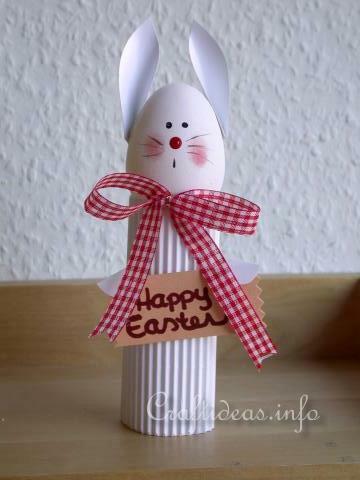 This is a cute and easy project if you are looking for a quick to make table or shelf decoration for Easter. One idea would be to create a set of these and use them as decoration for an Easter brunch table. 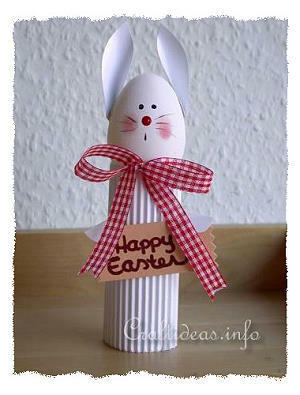 Instead of “Happy Easter” you can write the names of each guest on the card and place one at each setting. Older children can help make these but caution is recommended when using the hot glue gun. 1. Cut a piece of white corrugated cardboard to the size of 15 cm x 15 cm. 2. Roll the cardboard into a tube like form and overlap the beginning over the end and glue together with the tacky glue. You may choose to use paper-clips to hold the ends together until they are dry. 3. Design a face onto the egg. Using the size 0 brush, dot 2 eyes with black acrylic paint using the other end of the paint brush, clean the end then dot a red nose. Using the paint brush end, make a small line for the mouth. 4. Using the bristle paint brush, dry brush red paint on for rosy cheeks. 5. Make a bow out of the checked ribbon and lay aside. 6. Print out the patterns so that the ear is the measured size on the pattern (5.5 cm). Transfer 2 ears and 2 hands on white cardstock. Transfer the sign onto tan cardstock. 7. Cut out the sign and write “Happy Easter” on it using a red marker. 8. Glue the hands onto the top of the sign. 9. Fold the bottom of the ears slightly at the bottom and glue close. Use a paper clip to hold each one in place until the glue is dry. 10. Attach the ears to the egg with hot glue. 11. Hot glue the head into the top of the tube. 12. Hot glue the ribbon onto the tube. 13. Attach the sign with a piece of foam tape or hot glue it to the tube.